This experiment describes the use of a PC oscilloscope to measure the speed of sound. 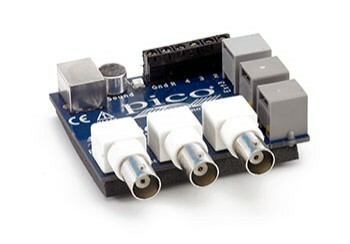 The ADC-212 used in this experiment has now been discontinued but the experiment can be performed with any PicoScope oscilloscope that has at least 2 channels. The experiment was set up as shown below with the two crystal microphones placed 1 metre apart. The Oscilloscope timebase was set to 500 µs/div and the trigger position set to 10% pre-trigger. This allows us to collect 500 µs of data before the bang and 4.5 ms of data during the event. The balloon was burst approximately 2 m away from the foremost Mic. The plot below shows the results clearly. The lefthand “Blue” trace is from the foremost Mic (Mic1) and the righthand “Red” trace is from the furthest Mic (Mic2). The waveform from Mic1 between -164 µs and 500 µs is clearly visible in the trace from Mic2 delayed by 2929 µs. There is a second variation, in the waveform from Mic1, around 1.5 ms caused by an echo from one of the walls or ceiling. From this plot we can measure the time between the two waveforms - 2929 µs. This is over 1 metre which equates to 341.4 m/s. When calculating the speed of sound through the air we need to take into account the factors which can affect the speed. Water Vapour content (Relative Humidity). The Temperature and Relative Humidity during the test were approximately 20 DegC and 50% respectively. We can use the table below to find the expected speed: 344 m/s or 2.907 ms/m. The matches very well with the observed results shown above. It is published here with the kind permission of “Longman Group Limited” publishers.